CORVALLIS, Ore. – Oregon State University roboticist Heather Knight is bringing the Robot Film Festival to Portland, on July 14, for the first time in its eight-year history. The festival has previously been in New York City, San Francisco, Pittsburgh and Los Angeles. Knight was the originator of the film festival as a graduate student at Carnegie Mellon University, and this will be her first time hosting it as an OSU faculty member. She says the festival is part of the growing robotics community in Oregon, sparked by the Collaborative Robotics and Intelligent Systems Institute (CoRIS) at OSU. “The goal is to bring together technologists, creatives, mountain climbers and maybe some hippies and get people talking about what we would want in the future for robotics. We like to inject some playfulness into the dialogue,” Knight said. The film program will feature several short films that run the gamut from serious to playful to dramatic; all have real or fictional robots as a central element to the story. Following the films will be a cocktail party including a robotics demonstration and art exhibits. The event will conclude with awards, called Botskers, bestowed by the festival committee. The awards ceremony will include entertainment such as Knight’s comedy robot, a chair robot dancing with a human, and large robots playing catch with beach balls. The festival is from 4 to 10 p.m. at McMenamins Mission Theater, 1624 NW Glisan St. Tickets are $15 and can be bought in advance. Robots get in free. The event is part of Knight’s focus on including community members in dialogue about robotics research. 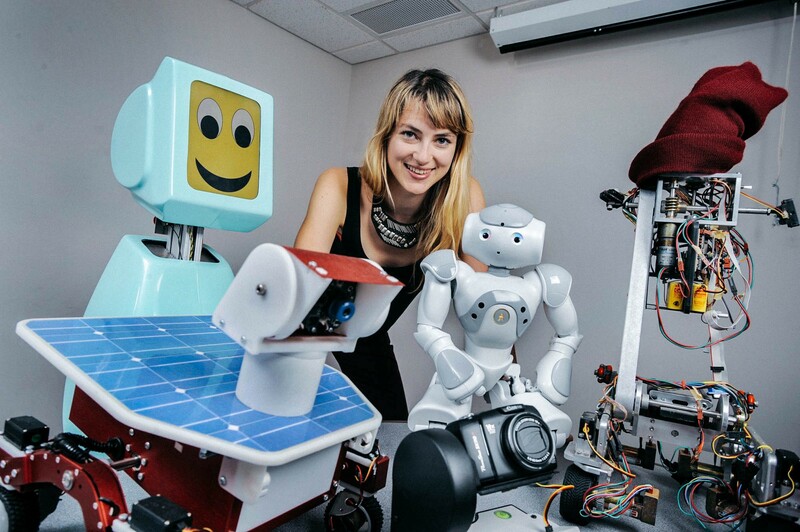 Her other engagement activities include the theater company Marilyn Monrobot, which she founded; a TED talk called “Silicon-based comedy”; and the Corvallis Science Pub talk, “Charismatic Robots,” which is available on video and podcast. Knight and other Oregon State faculty will also be part of daylong public symposium on Oct. 23 called “The Promise and the Peril of Artificial Intelligence and Robotics.” The symposium will bring to OSU national experts in AI and robotics together with industry members, policy makers and the general public to discuss potential benefits, risks, ethics and uncertainties of the emerging technologies of artificial intelligence and robotics.